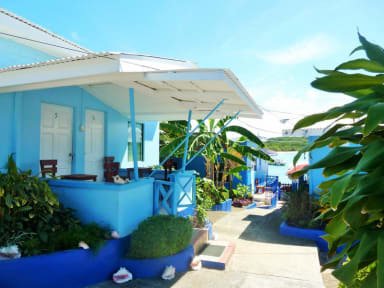 Miller's Guesthouse i Buccoo Point, Trinidad og Tobago: Reservér nu! Miller's Guesthouse is just a stone’s throw from a pristine beach and in a tranquil setting overlooking unspoilt Buccoo Bay, a departure point for the world famous Buccoo reef and Nylon Pool. Our lovely village is home of the famous goat races and unmissable weekly Sunday School party where you can listen to our local steel pan band. We have budget-friendly, self-catering apartments, dorm beds, single, double and triple rooms to accommodate single travellers, couples, groups and families of all sizes. All our rooms have a/c, cable TV and free WiFi. There is a laundry service, housekeeping every 2 days and guests have access to our communal kitchen and a small inhouse library. We have 2 outside areas, a long table under a gazebo with power points and a sun lounge area overlooking the bay. Also located on the premises is Luvinia’s Seafood & Steak Restaurant serving up delicious meals at very competitive prices, open 7 days a week for breakfast, lunch and dinner (closed on Mondays currently). 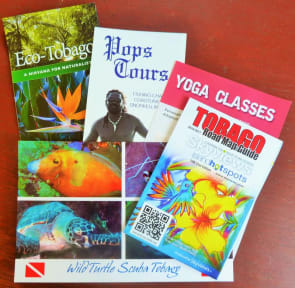 We also offer an information & tour booking service for various activities including island tours, reef tours to nearby Buccoo Reef/Nylon Pool, fishing, golfing, mountain biking, diving, snorkelling, horseback riding, yoga or even massage therapies. Car/bike rental can also be organised.